The industrialization of our economies around the world owes a debt to forging and the men and women who operate forging equipment. Without the ability to forge steel and other metals over the past century and a half, we would not have had the parts needed to manufacture cars, build aircraft, drill for oil, mine for minerals or lay down rail tracks. However, as with any process involving manual labor, automation is changing the game. Despite lagging behind many other industries, the forging industry is now increasingly requiring significant automation upgrades for both new equipment and remanufactured/rebuilt models of everything from horizontal forging machines and vertical presses, to hammers, and solid ball die forgers. In doing so, tasks that were once performed manually – such as moving heavy steel rods, pipe and other stock in and out of equipment – are now automated to improve worker safety. Gone are the days when three men would lift a heavy steel rod with a glowing end into, and out of, a horizontal upset forging press. Today, many of these manual tasks are instead being replaced with the mechanical “hand” of a robot or by integrating servos that can lift, insert and deposit materials. Even tasks such as automated tooling changes can be completed with the push of a button. Not only does this create a safer environment for forging operators, but productivity is increased. 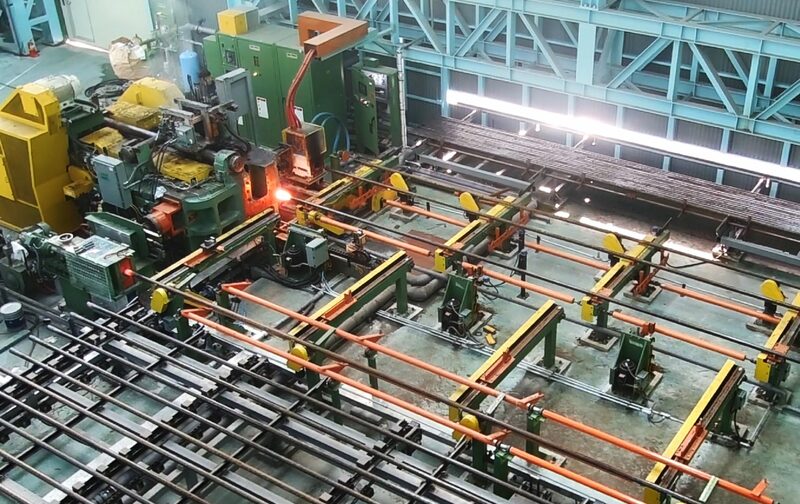 By automating forging operations to perform some of the tasks of a human operator, productivity can increase from several hundred pieces per hour to up to 3000, depending on the type of products being forged. According to Ken Copeland, president of Ajax-CECO, the vast majority of project requests today involve some aspect of automation. that has an automation component,” says Copeland. Ajax-CECO, as it is now known, is one of the oldest manufacturers of forging equipment, having begun operations in 1875. In its more than 140 years of history, the company has built and put into production more than 6,000 horizontal and vertical forging presses. In 2005, the company purchased the intellectual property of the Chambersburg Engineering Company and now manufactures and supports both brands of equipment. According to Copeland, most of the automation requests are for control consoles or some type of material handling and conveying equipment to bring the steel into the machine, move it around as needed for heating and forging, then finally deposit the finished item into a bin when completed. In the most advanced examples, entire forging line “cells” can be created that include sophisticated communications that report production rates and machine performance back to company networks. This demand, Copeland adds, applies to both new and existing forging equipment. “It is not uncommon for a customer that has, or acquires, an older model of equipment to send it to us to be rebuilt or remanufactured while adding automation upgrades to it,” says Copeland. Modern Forge Tennessee is one of such companies. A hot steel forging company that makes motorcycle parts for Harley Davidson among other customers, Modern Forge uses Chambersburg (CECO) die forgers that date back to the 1980’s and weigh between 20 and 50 tons. The company has more than 7000 dies in its inventory. To continue to leverage their investment in their existing equipment, Modern Forge decided to update and upgrade the consoles on its drop hammers to improve performance, given they run their equipment hard and at very tight tolerances. Automation of material handling plays a key role in today’s forging equipment solutions. Aware that the intellectual property of Chambersburg Engineering had been purchased by the Ajax Manufacturing Company, Ferguson decided to reach out to them for the automation upgrade. “Ajax-CECO was able to build the new panels, create the necessary software to run it and calibrate it all to our specific needs,” says Ferguson. According to Ferguson, Modern Forge of Tennessee will also possibly be installing a robot on its trim press later this year to handle production delays that were impacting the quality of the trim removal. After observing operators to determine how long it took to trim each part, they were able to determine that when they got tired, the work would slow considerably and they would get behind. When too much time passed between parts, the platters would cool off enough to making trimming difficult. Now, after the hammer operator completes the forging, the robot will pick up the item and trim it consistently each time. At the Eaton Corporation forging operation in Kearney, Nebraska, the company operates 26 Ajax-CECO 100 to 1300-ton forging presses. Eaton remains one of the top producers of engine valves and precision gears for the North American automotive industry. The Kearney facility also manufactures precision-forged parts for agriculture, marine, ATVs, automotive and heavy duty. As part of a two-stage process for creating its engine valves, a round steel slug is formed into an “onion-head” shape using a forging die press. The item is then transferred to a re-strike die where it is formed into the final product. For many years the transfer from the first to the second stage of the process was performed manually by an operator at the machine. 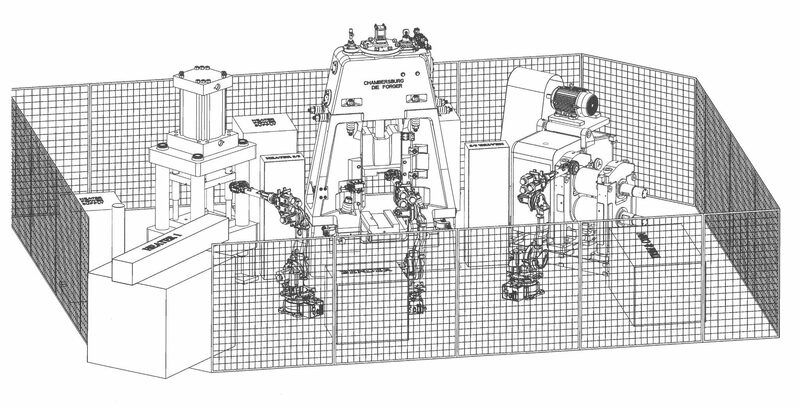 This line drawing depicts on of Ajax-CECO’s projects – an automated forging line intended to increase production speed and reduce the need for manual material handling. Approximately 4 years ago, Eaton undertook a project to automate so that the operator only needs to push a button and a robotic arm completes the transfer. 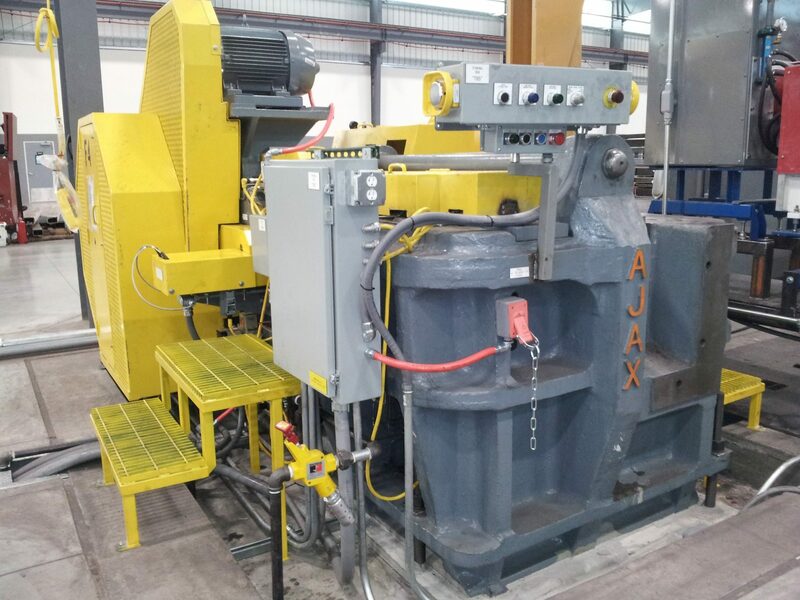 The upgrade was applied to 15 of the Ajax-CECO presses that were used specifically to produce the engine valves. The primary driver for automating was worker safety, according to Randy Kreutzer, lead maintenance manager at Eaton. Kreutzer adds that there was a benefit in increased productivity as well, because it allowed Eaton to run two presses instead of just one. or visit them online at www.ajax-ceco.com. Stephen Armstrong is a Tustin, Calif.-based freelance writer. He has researched and written about industrial technologies, healthcare, automotive and international trade for the past 15 years.